So I did zero research on this before watching it, and I was totally unprepared for the Jersey accents. Haha. 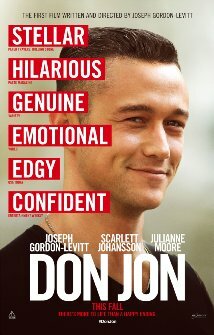 My main reason for seeing this was to support one of my favorite actors, Joseph Gordon-Levitt. Had any other actor made this film, I probably wouldn’t have felt so inclined to see it as the premise isn’t something I’m typically interested in. I love what JGL is doing with his production company, HitRECord, and I am very happy for him that he was able to release this project of his. It actually reminded me of the tone of (500) Days of Summer (2009), and I think I enjoyed it as much as I did that movie. I was definitely surprised by the movie, despite walking in not knowing what to expect anyway. I think the story was also both realistic and honest. It’s not your typical chick flick. Sure, the guy gets the girl, but it’s not really smooth sailing and happily ever after. The ending might not seem realistic to people completely sold into the whole fairy-tale ending type of movies, but in its own way, the way it ends kind of is one, just not the one people might be waiting/hoping for. In some ways, I think this movie was a bunch of real-talk. I felt like JGL was sitting the audience down for a session of straight-up, like look, this is what people think relationships are going to be like; boy meets girl and then that’s it, knight in shining armor rides off into the sunset with princess in tow, but that’s not how it really works in reality. Relationships are work and take mutual effort, and a pretty package does not necessarily equate to total satisfaction. Call it backwards or traditional in ways, but I liked the story overall. At the same time, I can see people not liking the story because it doesn’t end in the way they probably hoped it would while watching. It might not be an action-packed thriller, but I thought it was still a decent movie to watch. Now is it worth watching on the big screen? I think that depends on the type of movie-goer you are. If you’re like me and you like to support all your favorite actors as much as possible, then yes, I think you should go watch it in theaters. If you prefer to only go to the movies if you think the film to get the full experience of special effects that overload your senses and an action-packed movie that pumps you up with adrenaline, then this might be more of a rental option for you instead. As one who calls New Jersey my home, I think the accents are something I can deal with. 😛 This movie looks good though, so I might check it out! Sorry I am so late in responding to this, haha. Yeah, I liked it. Gets a tad messy towards the end, however, still had me impressed by what this guy could do behind the camera. I knew he always had it in him, I guess I just needed a little something to prove it to me, and this was it. Good review Rae. Little bit, but yeah! I think he’s a pretty well-rounded actor.